This looks like an M26 Adrian to me. The rivets are the give away. I have an M15 Artillery Adrian. I'll try to get some photos. So we would say "No longer with us 'but' forever close to the German heart". This is probably a commemorative coin celebrating Otto von Bismarck. I tend to agree with Amy. This looks like a Belarus copy. I know this will sound strange --- but it looks too good to be from India. There are always several copies from Belarus on Ebay. Some are quite convincing --- others, not so much. Judging by the shape of the bandeaux there is a cipher behind the Saxon plate. Is this the only Wappen used by the school? Did the school use a Koenig Wappen or just the Fuerst? Absolutely beautiful helmet by the way. Boy are you on the wrong website! 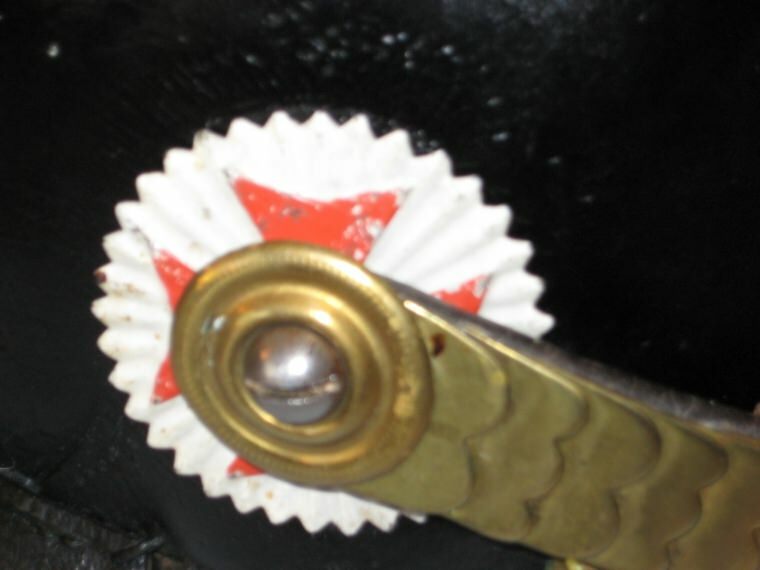 A couple of makers used a metal tag that was held on by one of the spike base studs. They could be removed if the stud nut was taken off. One maker (probably more) used a paper label in their metal helmets. I would not think it unusual to find an M15 JzP without a maker's mark. So; to understand this correctly, they were neither military nor police, but more like Customs and Tax Guard or Financial Administration? More like the customs officer you would see at an airport, than a border patrol agent. We can always count on Glenn to steer us straight! Doesn't "a La Suite" mean one after another, or possibly following? It doesn't seem to make sense after a title or name. I agree with Alan for the activation idea. I do too. Spam is becoming a daily issue. I have a Bremen IR75, M1860, dated 1866 with the Maltese cross cockade, an officer's Model 1867 from GR9, and an M60 from MFR36, if that would help you. Very nice. The most I've ever purchased at one time is two. I have a Zenith 12-S-568 that has just enough wear on the console that it needs a restoration. Does anyone have a recomendation for someone who does restoration in Missouri or Illinois? I'm still waiting to see a side view . Any chance you can get some photos of the profile? When will we get some photos? It certainly seems to have cleaned it up. Didn't change the patina too much either. I have never seen one configured for the military with brass visor trim fore and aft. Did anybody on this forum get the piece that started this thread? I saw that it closed today on Ebay. 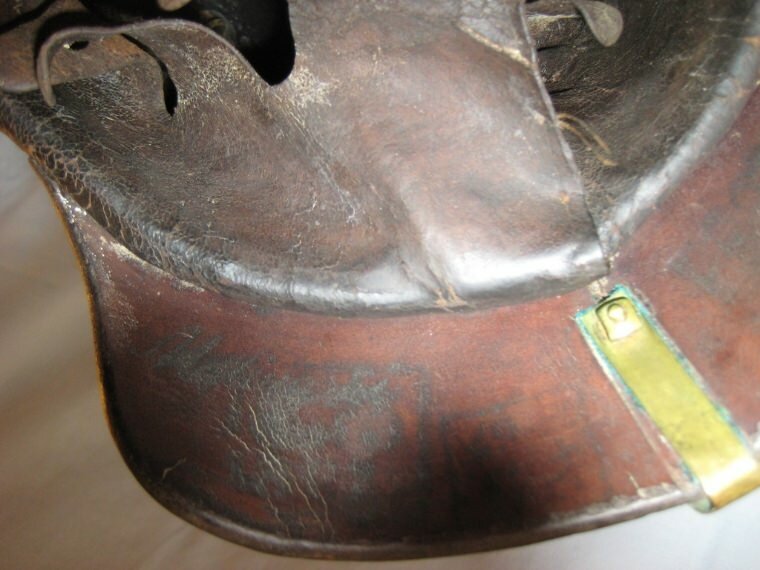 The cardboard liner and bent pins shown on the inside look to be Napoleonic period. Not sure about the green linen. I don't like the reverse of the Wappen. The solder looks new and I have not seen the use of washers in this fashion before on period pieces. Can you get a side view? The cipher is from Frederick I of Prussia. The crown is also Prussian. The diamond shape of the Wappen is more French than Prussian, but these items were re-worked many times. Looks like an unusual piece. Can you provide photos of the sides and liner? Honestly I think it looks more like dried polish than verdigris. You might try washing it off with dish soap and a soft (very soft) brush. Pardon me --- I lied. My wife read this post and asked if I was referring to the helmet I was so disappointed with about eleven years ago. I said it was, and she said it didn't come from Germany --- it came from England. I suppose I should have known better to start with. Is the spike on a Pickelhaube considered a weapon as well? When you get it shine a blacklight on the red band and the linen liner. If they glow under blacklight I would say send it back. If they don't I would say congratulations are in order.